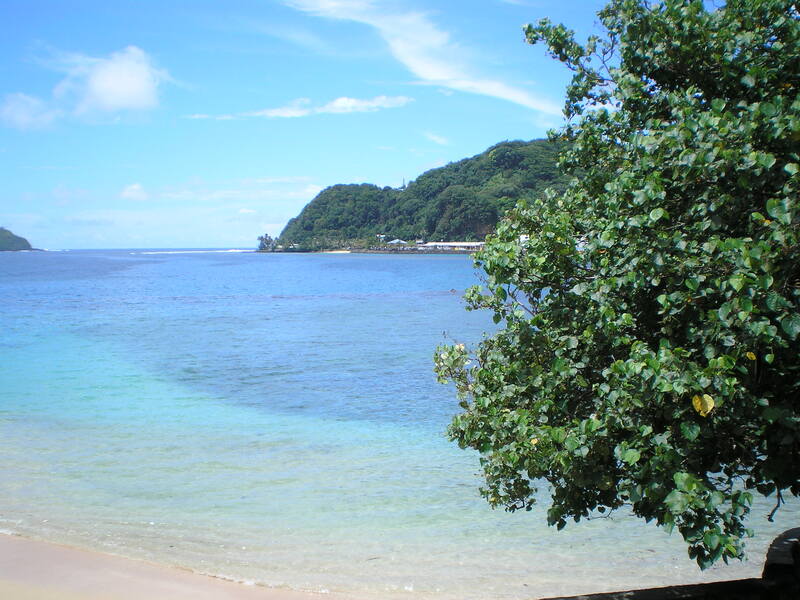 A tropical beach and azure seas in Pago Pago, American Sa'moa. We arrived in Pago Pago yesterday around midnight. A fierce storm had just passed through dumping rain everywhere, evidence of which still remained on the tarmac. Exiting the plane came with a blast of hot, humid air like a furnace on full blast. Through the thick air, we could barely make out a long string of lights illuminating the single road defining the island’s coastline. As we queued up with our belongings, we were greeted by the Immigration & Customs agents of American Samoa. All the officials greeted us with enthusiasm and welcomed us to their island. Unlike our U.S.customs, each department wore a different colored uniform which consisted of a matching shirt and lava lava, which resembled a wrap around skirt. Bags were inspected, questions were answered, and we were off to our next destination. We arrived at Sadies by the Sea, a seaside hotel situated next to a shallow bay. After settling into the room, I ventured out onto my little porch/ lanai to view the scene only to see giant “flying foxes” of the area. The enormous fruit bats that encircled overhead were common to the island. I was lulled to sleep by soft lapping sounds of waves as they greeting the shore. The excitement of the day soon turned to sleepy eyes and happy thoughts of what will come tomorrow and the next adventure. 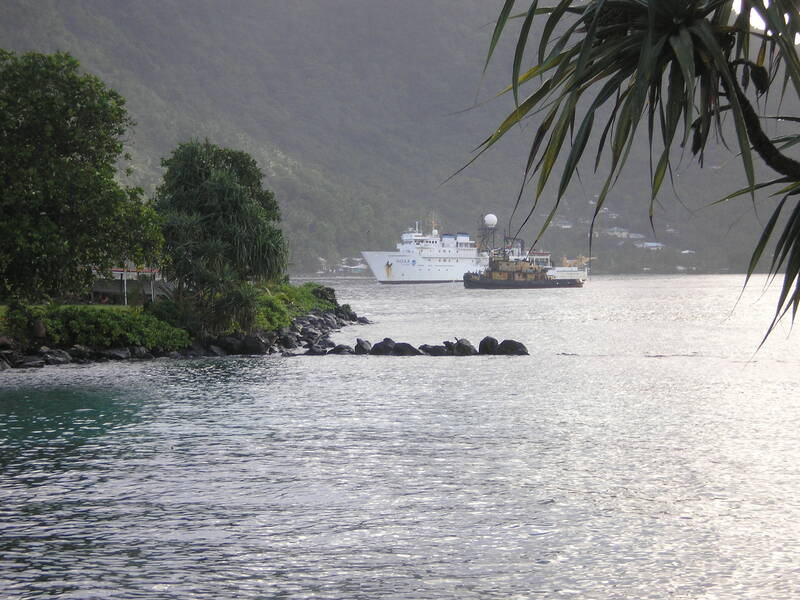 This entry was posted in 2012, Jennifer Fry 2012, NOAA, NOAA Fisheries Service, NOAA Teacher at Sea and tagged American Samoa, NOAA Ship Oscar Elton Sette, Pago Pago. Bookmark the permalink. It is thrilling for all of us to be able to share your impressions and emotions with us. I feel as if I am there with you in may ways. Thanks for your descriptive writing, it makes it all so vivid. So nice to live vicariously through your experience.